Ukrainian President Petro Poroshenko has called an end to Ukraine's ceasefire agreement with pro-Russian separatists, announcing, "we will attack, and we will free our country." The initial ceasefire agreement between the groups ended Monday after 10 days of accusations and attacks from both sides. According to USA Today, more than 400 people have been killed since fighting started in April. 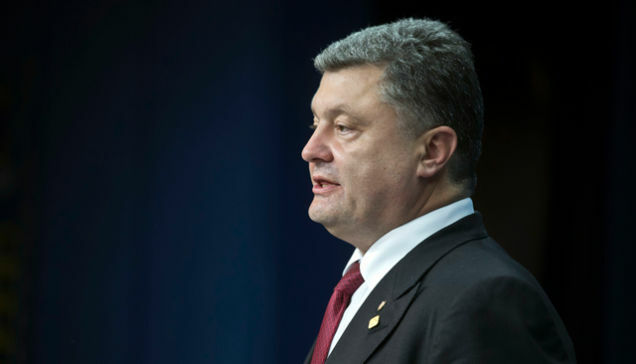 "The unique chance to put the peace plan into practice was not realized," Poroshenko said in a speech to the country. "This happened because of the criminal actions of the fighters." Near the Ukrainian army's command center near the eastern town of Izyum, troops appeared to be gearing up for an offensive against the rebels. For days, heavy tanks and armored personnel carriers have been visible on the roads near Izyum rumbling toward front lines near the rebel stronghold of Slovyansk. On Monday, a convoy of more than a dozen heavy trucks carrying heavy multiple-rocket launchers passed through the city. Trucks carrying heavy artillery continued to move through Izyum toward rebel lines as the cease-fire formally ended, and a firefight lighted up the horizon southwest of the city. Ukraine's decision to end the ceasefire came after days of talks between Russian President Vladimir Putin, German Chancellor Angela Merkel, and French President Francois Hollande, who all urged Poroshenko to move forward with an extended ceasefire. Putin has called-up reserve units of his military, which Ukrainian generals believe means he's planning to invade Ukraine, says Phill Karber, president of the Potomac Foundation, based on meetings Monday with Ukrainian military commanders. The generals believe the 10-day ceasefire that ended Monday gave separatists who were "on the ropes" a chance to regroup, resupply with weapons and new fighters from Russia, and prevented Ukrainian forces from surrounding and cutting off the insurgents when they had the chance, Karber said. Merkel and other European Union leaders have threatened a new round of sanctions on Russia if Putin fails to use his influence with the separatists in Ukraine to stop their insurgency. At least 420 people have died since the militants began occupying government buildings, police stations and armories in Donetsk and Luhansk after Russia seized and annexed Ukraine's Crimean peninsula in March. The separatist leaders have appealed to Russia to annex their territories, but Putin has ignored them, apparently to avoid a heavier sanctions blow from Western countries seeking to punish his seizing Crimea in violation of international law. "We will attack and liberate our land. Not renewing the cease-fire is our response to terrorists, militants, looters, all of those who are tormenting the local population, paralyzing the region's economy, preventing payment of salaries, pensions and grants, blowing up the railway, destroying water pipes, depriving people of normal peaceful life."